Tonight, HBO will premiere its new James Brown documentary 'Mr Dynamite', directed by Oscar-winner Alex Gibney. The movie charts the rise of the Godfather of Soul as he revolutionised the music industry and became a prominent philanthropist and civil rights campaigner. 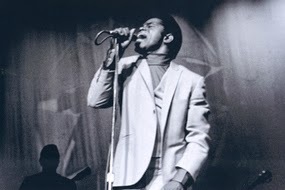 James Brown at the Harlem Apollo. Photo: Emilio Grossi. Permission: HBO. About 10 days ago I was contacted by HBO and asked if I would like to interview Clyde Stubblefield and Jabo Starks, the drummers who played on many of Mr Brown's most important songs. Of course, I leapt at the chance. The pair told me many hilarious stories about life on the road with the famously tempestuous star. In a new Huffington Post article I have published, alongside extracts of my existing unpublished interviews with saxophonist Pee Wee Ellis and trombonist Levi Rasbury, some of what they had to say.